Another week another update! As always we have been working really hard and are ready to share the results with you. This week we have welcomed two new members to our team and a great new partnership coming our way, we couldn’t be more excited! We’ve also published the events that we will attend in the future on our website, so you can come and meet us in person. As always leave your feedback - we are always glad to hear from our community! Interview with Joseph Derkos- Senior Account Executive, Digital Supply Chain Specialist at SAP, expert in the arena of automotive sales analytics, with a focus in the used and Certified Pre-Owned market. In this interview Joseph is talking about his career path and experience in the industry. He is talking about the future of the automotive industry, the way it is transforming right now. Joseph is sharing his vision of VINchain and the future he sees for the company! We’re excited to share another week of developments with our incredible supporters. We will soon be listed on exchanges and are negotiating partnerships with major manufacturers. Thank you all for being with us through our growth, we appreciate your support of the VINchain revolution! As always, please leave comments - all feedback is appreciated. VINchain is enrolled to take part in the listing competition on the KuCoin exchange, and we need your help! The winner of this competition will receive a free listing on KuCoin - this is something that will benefit all of us. To help us win please join KuCoin’s telegram channel ( https://t.me/KuCoin_Telegram_C... ) and read the pinned message. The competition will start on July 12th 18.00 (UTC+8) and run until July 15th 18.00 (UTC+8). We’re happy to share an exciting development with you all. After our fruitful initial coin offering (ICO) period, a major focus has been developing the onboard diagnostic (OBD) device. We’re enthused to announce that the alpha version of the OBD device is ready for use and you can check out the development! We are delighted to announce the results of another week of hard work. We were able to complete our listing on the International Digital Asset Exchange (IDAX), we’re participating in the KuCoin listing competition, and we launched the alpha version of our onboard diagnostic (OBD) device! We look forward to hearing your feedback on these developments as they wouldn't have been possible without you! Thank you for being with us from the start and let’s revolutionize the automotive industry together! VINchain is thrilled to introduce you our new adviser - Nitesh Mistry. He is an Owner of Support305 and a machine learning, cryptocurrency and blockchain enthusiast that is ready to change the future together with VINchain! Dash and VINchain have entered into a partnership, to leverage their joint interest in using data to improve vehicle ownership and maintenance. Dash offers smart driving products for both consumer and business vehicles, helping make driving safer, greener and more affordable for drivers. VINchain offers a decentralized blockchain-based vehicle history report, to authenticate vehicle maintenance, repair and ownership. We are sad to say we have a warning to share with you all today. 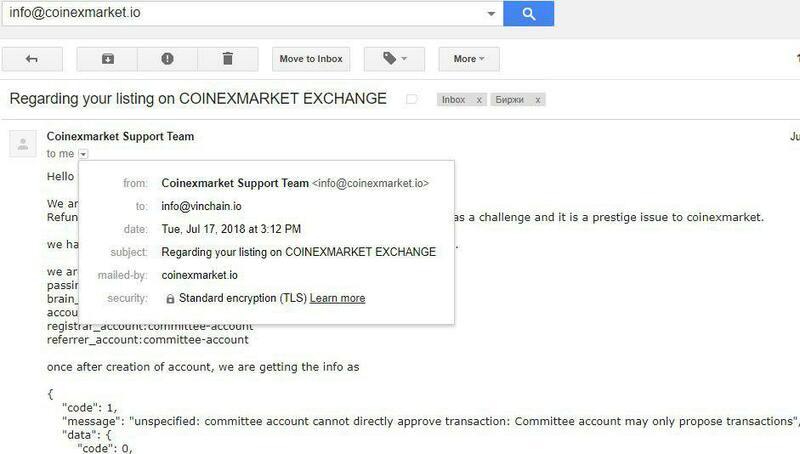 We’ve been moving forward with our focus of getting listed on more exchanges and one of them was CoinEx Market (https://www.coinexmarket.io ). We made an agreement and prepayment (of one Bitcoin) for listing months ago, but they never integrated us onto their exchange due to their corruption and shady business practices. 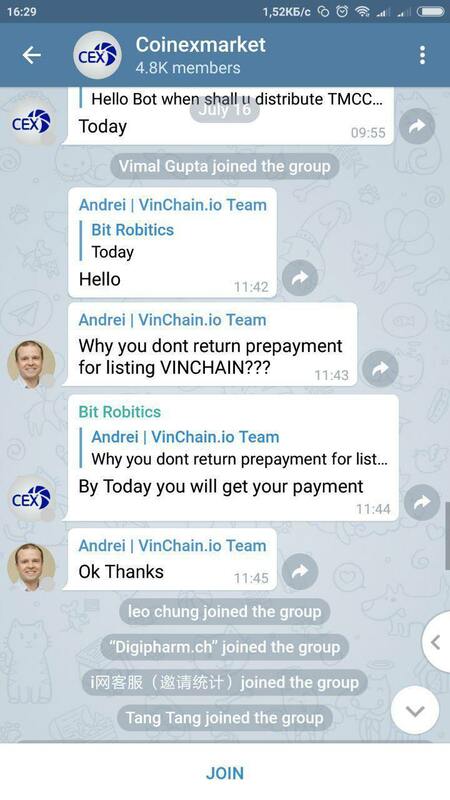 They started by postponing the listing process and requesting more time, now they are refusing to return the prepayment. We want to ensure our community is aware of CoinEx Market’s reputation and avoid them at all costs. These business practices and lack of transparency are exactly what we seek to solve by building the VINchain network, and we are thankful as always for your incredible support. We’re happy to share the successes brought by another week. More partnerships are being forged and we’ve recruited incredible new team members! We’re currently focusing our efforts on the development of our system, so you will soon be able to experience it firsthand. As always, we are endlessly grateful to our community and appreciate your feedback. Get 100,000 VIN tokens for free! 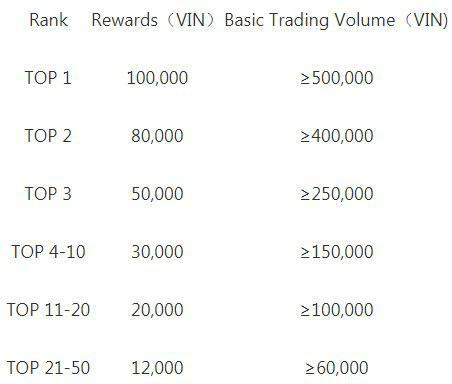 Don’t miss VIN Trading Campaign! We have a special announcement for you! IDAX is starting VIN Trading Campaign! 1,000,000 VIN will be given away during this period of time! The campaign will be held on July 31st 00:00:00 - Aug 14th 23:59:59 (UTC +8). Currently, after you complete the token swap you receive your tokens within 24 hours. This token swap process has been active and available for a very long time, and a very limited amount of users still remain to go through the token swap, so we are making some small changes. Starting from August 1st you will be receiving your tokens in your VIN wallet once a week on Friday after you complete the token swap! Every week we will be posting a list of people who received them so everyone will be updated regularly. Thank you for being with us and supporting VINchain! Together we’ll go far! Interview with Mark Taylor from PureCars! We are eager to share with you an interview between Alex Miles, our CEO, and Mark Taylor, our brilliant advisor. Mark shares his perspective on VINchain, reasons for joining us and outlook on our future growth. We discussed his extensive experience in the automotive industry including his career at PureCars and his 15-year journey with AutoNation, the largest automotive retailer in the US. The interview provides an expert’s insight into VINchain and we hope you enjoy listening as much as we enjoyed recording it. As always, we look forward to your feedback and thank you for your enthusiastic support, none of this would be possible without our incredible community. Another week has gone by and it's been 15 weeks today since we have finished our ICO. We can not be happier to share this amazing journey with us! As you all know we are constantly working on the development of the system and hope that you are ready for the project to show its full potential! We are extremely joyful to have such a wonderful and strong community, that are interested in our project and the bright future that stands ahead of us. Thank you so much for being with us from the start and let's reach the moon together! As always please leave your comments down below as we really value the feedback from our community! As it was mentioned in our white paper we are creating a system where all information about a vehicle will be evaluated according to the rating of importance. That is why we would like to ask you what information you value the most. Your opinion is important to us and that's why we ask you to help us out and fill out a brief survey. This will help us understand what information you value the most when purchasing your car! Thank you all so much for your time, your feedback, and your participation. Your input will help shape our internal system logic, and your contribution will ultimately change the face of the automotive landscape. Let’s create an awesome system, so we can all revolutionize the automotive industry together! We have Amazing news coming your way. We’re overjoyed to present to you our first live and fully integrated partnership! Starting on August 7th Consumers will have the opportunity to request VINchain approved information via our partnering website. (https://www.vininspect.com/en ). You will have the convenience of ordering a vehicle report via VINchain tokens. Each report will have the VINchain blockchain verification guarantee - so you as the consumer can rest assured that it’s worthy of your trust! We’re grateful to count VinInspect as one of our valuable partners and are excited to announce that they’ve successfully implemented our blockchain system. The automotive industry is changing rapidly and is ripe to be disrupted by new technologies like VINchain. VinInspect adopting and demonstrating the power of the VINchain blockchain is an important step in our timeline of expanding in the United States and globally. As we expand our partnerships and they implement our vision, we get closer every day to revolutionizing the automotive industry as a whole.